Born in Waterford, Connecticut, Henry Pember Smith learned to paint without a teacher. He studied works of the Old Masters during his travels throughout Europe and acquired a reputation as an accomplished landscape painter fairly early in his career. 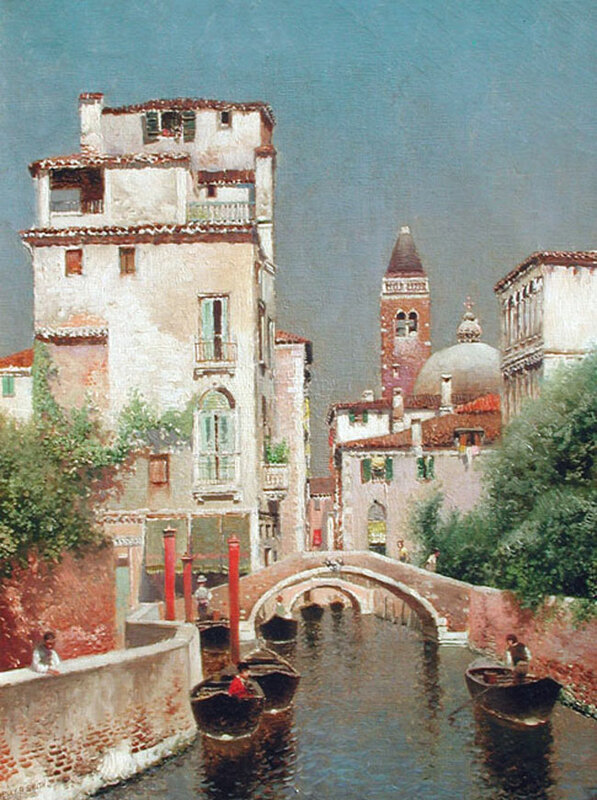 While he visited Paris, Brittany, and Normandy in the 1880s, he also took an extended trip to Venice, and subsequently produced interesting works on subjects he had encountered there. Like many of his pieces portraying aspects of the European cities he had visited, Smith’s pictures of Venice often reveal an impressionistic fascination with light and water; images of the muted red brick buildings and campaniles are enveloped in the soft glow of a sunset. In the United States, Smith painted numerous views of the New England landscape, particularly those of Cape Ann, Rhode Island, and New Jersey, and exhibited these regularly at the National Academy of Design in New York. Though little is known about the artist’s career prior to 1877, after which time he maintained studios in Manhattan at 11th, 171th, and West 14th Street. Adopting a method of interpretation similar to his artistic contemporaries, Smith deliberately chose to paint idealized depictions of his own rural landscape in order to satisfy the urban taste for this kind of imagery. Nevertheless, Smith may still be considered one of the foremost American realist painters of his time due to his detailed representations of country cottages and seascapes. He was a member of the American Watercolor Society as well as the Artists’ Fund Society. Currently there are no available Henry Pember Smith paintings for sale at the Mark Murray Gallery. Please contact us if you are interested in selling your Henry Pember Smith paintings or other artwork from the 19th century and early 20th century.